Safely Sitting in Port by Lee Seong-gwan along Route 15-B on March 15. There is no guided walk on the trail. The walk was a Clean Olle event on Route 3-A. Sunrise was at 6:43 a.m. and sunset will be at 6:43 p.m.
We have a high of 14°C with clear sky and a light to gentle wind (2-3 m/s) blowing south-east or south. It’s going to be a glorious spring day outside. Another Stamp in the Passport by Lee Seong-gwan during the Route 14-1 guided walk on February 25. There are TWO guided walks. No Jeong-yeol is with 4 pre-registered walkers on Route 18. Kim Jung-gil is on Route 5 with 13 pre-registered walkers. Photos in a random order from Route 14-1. Everyone set-off at 9:30 a.m. and finished by 1 p.m along a 9.4 km distance. Sunrise was at 7:07 a.m. and sunset will be at 6:27 p.m.
We have a high of 12°C again with little cloud to clear sky and an even lighter to gentle wind (2-3 m/s) blowing south. Get outside and enjoy. 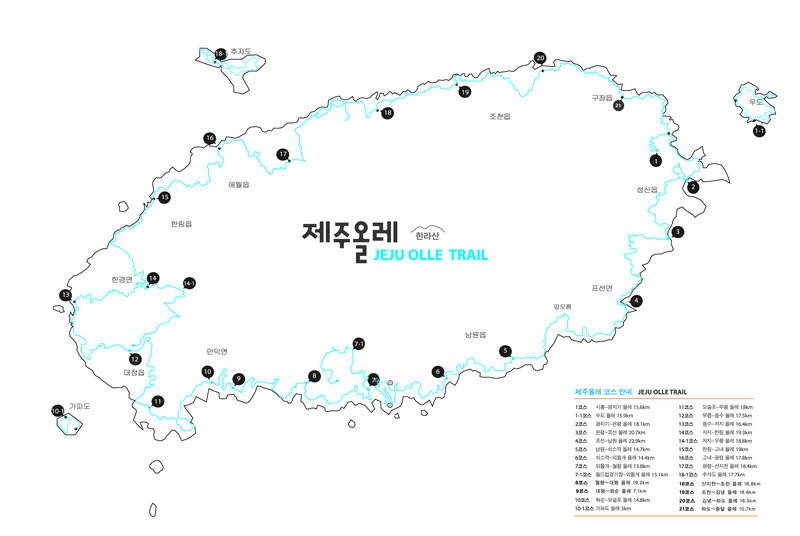 The Real Olle Path in Jocheon along Route 18 during the guided walk on February 18. Olle means a small path from the home to the street. There is ONE guided walk on the trail. Kim Yeong-ju will be leading an astonishing 29 walkers on a reverse Route 21 walk. So they’ll all be starting at the Route 21 end point for 9:30 a.m. According to yesterday’s guide, Choi Gi-seon, 25 walkers departed along Route 20 (reverse) and 25 finished at about 3:15 p.m.
Sunrise was at 7:12 a.m. and sunset will be at 6:23 p.m. The temperature climbs a little bit today with a high of 9°C. There will be cloud and patchy clear sky in places. A gentle wind (4 m/s) is going to blow south. Nothing out of the ordinary to report.